If anything is guaranteed to put a dampener on our annual stint abroad, it’s likely to be the prospect of petty arguments with family and friends disrupting what should be a relaxing break. According to the latest survey results this is exactly the scenario that is playing out for the vast majority of holidaying Brits, as 92% find their days in the sun marred by an argument with their nearest and dearest. This figure comes as part of a survey of 1,000 travellers conducted by accommodation rental site HouseTrip, which also revealed that more than half of those questioned spent 15 minutes or more rowing with their holiday companions. Further insights from the survey revealed the main triggers for arguments on holiday, with forgetting holiday essentials most likely to put travellers in a spin. This was followed by getting lost, but not taking the initiative to ask for directions and fussy children who aren’t prepared to take a chance on the delights of local cuisines. Other scenarios that are likely to send holiday harmony off course include quibbling over where to head out for an evening meal and decisions over which playlist to put on during car journeys. “It’s more important than ever to have a vacation that lets us relax and recharge our batteries, free of the pressures of daily life. “The trouble is, a holiday can actually make things worse. Research released by TravelSupermarket at the end of last year also revealed that family holidays are far from plain sailing. It showed that more than half (56%) of couples argue on holiday, with getting to grips with driving instructions one of the scenarios most likely (39%) to prompt a heated discussion. 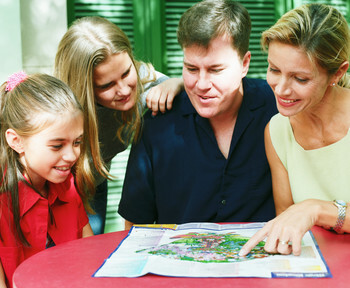 Take the stress out of one element of your holiday planning by organising family travel insurance in advance.